Annual or perennial herbs, usually with brittle stem and watery juice, erect to sprawling or straggling, mostly glabrous. Leaves usually alternate, much divided without jointed segments. Inflorescence a raceme or spike, rarely 1(or 2-3)-flowered, terminal or leaf-opposed. Flowers small, bisexual, usually zygomorhic, hypogynous, generally pedicellate and bracteate. Sepals 2, small, scale-like, caducous. Petals 4, in two dissimilar whorls, 2 outer longer and larger, one or both spurred or saccate, ± connivent; 2 inner smaller, narrower, and often coherent at tips. Stamens 2 (apparently 6 in 2 bundles), tripartite, the central branch bearing a dithecous anther, the lateral branches bearing monothecous stamens. Ovary 1-celled, with 2 parietal placenta, each bearing 1-many anatropous ovules; style simple, long or short with obtuse or lobed stigma. Fruit a 2-valved capsule or a nutlet. Seeds with minute embryo and copious endosperm. About 14 genera and nearly 400 species, chiefly of the north temperate zone and S.E. Africa; represented in Pakistan by 2 genera and c. 30 species, mostly in the hilly regions. This family is closely allied to Papaveraceae and sometimes considered a subfamily (Fumarioideae) of this (Fedde in Engler & Prantl, Natur. Pflanzenfam. ed. 2, 17 b: 121. 1936; Davis, Fl. Turk. 1:238. 1965). It is distinguished mainly by its corolla (usually spurred), dimorphous anthers in each bundle of stamens, and watery juice. The flowers are zygomorphic and the axis becomes twisted so that one of the outer petals appears to be at the top of flower and is called the ‘upper petal’ or the ‘posterior petal’. Acknowledgements: We are grateful to the United States Department of Agriculture for financing this research under P. L. 480. Thanks are also due to Messrs. B. L. Burtt, I. C. Hedge, J. Cullen and Dr. R .R. Stewart for useful suggestions. 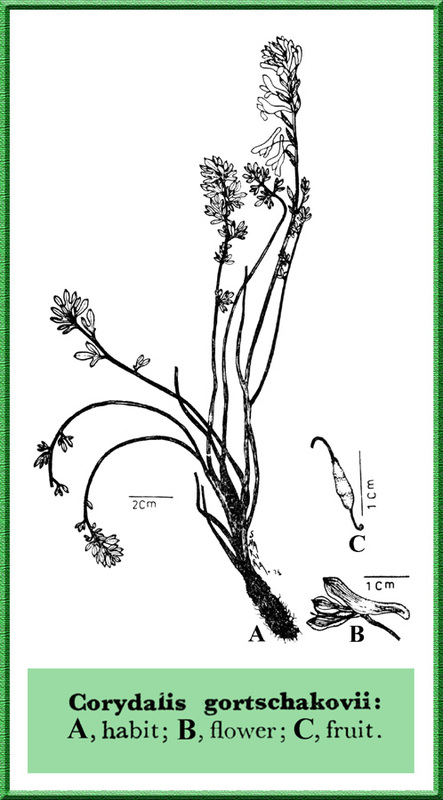 Cysticorydalis Fedde = Corydalis Medik.